BENGALURU: More than half of Metro commuters are finally availing the 15 per cent discount offered on travel by making use of Smart cards for their journeys. For the first time since Metro trains became operational in the City, more than 50 per cent of commuters on both the Green and Purple Lines have them as revealed by statistics made public for the just concluded financial year. The number of users of the ‘Varshik’ cards on the Baiyappanahalli-Mysuru Road (Purple Line) stretch stands at 58.83 per cent while that on the Nagasandra-Yelachenahalli (Green Line) stretch is 51.16 per cent of the overall ridership, said Mahendra Jain, Managing Director, Bangalore Metro Rail Corporation Limited (BMRCL). 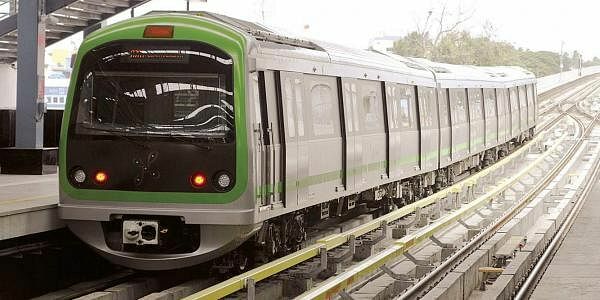 higher than even what Delhi Metro offers its commuters.” While the Delhi Metro Rail Corporation Limited had offered only a 10 per cent discount on its card for 15 years, in October 2017 it increased the discount offered on such cards during non- peak hours alone by an additional ten percent. 70 per cent of its commuters are Smart card users. “The average ridership for 2018 is only around the 3.4 lakh band since ridership really picked up only after the full Phase-I opened up for public only one quarter of the financial year concluded (June 18,2017). patronage presently brings down the daily ridership average, Shankar said. The increase in value offered on the Stored Value on these cards is also a reason, the ED said. BMRCL had increased the top up offered on the cards from `1,500 to `3,000 for the cards from February 2018 so that office goers can top up just once a month.